1908. "University Circle, Cleveland, Ohio -- Case Western Reserve University." 8x10 inch dry plate glass negative, Detroit Publishing Company. View full size. Submitted by SilentEchoes57 on Mon, 09/17/2018 - 8:10pm. is mostly still there. I aligned all the buildings in this photo with the 1912-1913 Sanborn map (Vol. 9 - Sheet 26). The campus had two buildings with a 5-story central tower facing west. The prominent central building is gone. But the building to the left, generally within the corner of Euclid and Adelbert, is still there, although the roof and dormer windows have been reconfigured, so it's not an exact match today. Submitted by Mongo on Mon, 09/17/2018 - 5:54pm. The building on the left is called Adelbert Hall and was destroyed by fire in 1991 and rebuilt soon afterward. The next building was called "Case Main" and it was raised in 1972 and it sandstone used to make the fountain outside of Yost hall. The third building is a bit of a bafflement. Adelbert Hall was named after Amassa Stone's son drowned while a student at Yale in 1865. Submitted by jsmakbkr on Sun, 09/16/2018 - 10:34pm. 1908. 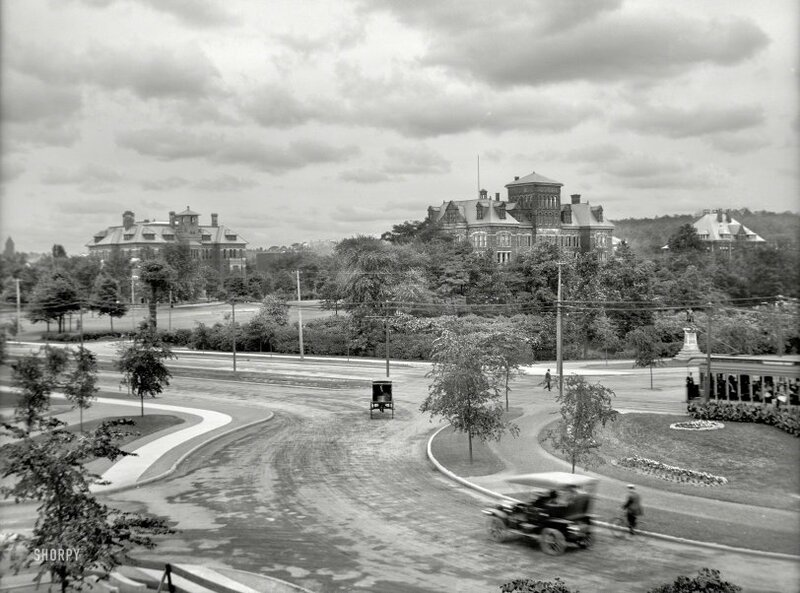 "University Circle, Cleveland, Ohio" -- Case School of Applied Science, Western Reserve University. Submitted by BillyB on Sun, 09/16/2018 - 9:07am. Compared to today's circles, are these folks are going the wrong way around? Submitted by DaveA on Sun, 09/16/2018 - 7:15am. Any idea who it is prominently displayed in the background? Could not seem to pin down anything in the modern views of Euclid Avenue. Maybe moved elsewhere? Submitted by K. McCool on Sun, 09/16/2018 - 5:40am. Goodness! It looks we have a streetcar track bisecting a roundabout which is being shared by a horse-drawn van, an automobile, and a bicyclist. Who will be the first one involved in an accident?